This half-glass home in the Netherlands sets the stage for garden living, by Sarah Dallof. Today our project has been published on Dwell. 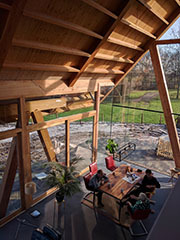 RV Architecture reïnterpret the barn house with a halve glass, halve brick house, supported by expressive wooden beams. Today in the Archello newsletter! Tjo, the dog. 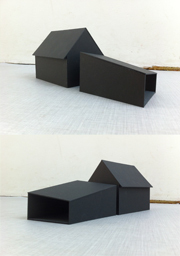 Our star model for the 'Barnhouse inspired by Catalogue-homes'. The recently finished Barnhouse in Werkhoven has been included on the project list of our website. With beautiful photos of René de Wit. For more information look at: projects/ Barnhouse Werkhoven. 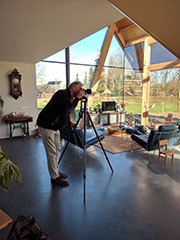 It's always a special moment when architecture photographer René de Wit is making photos of one of our projects. It's wonderful to see on google-maps that our design for the Steve Bikostraat in Utrecht actually works! With a relatively small L-shaped extension we made defined areas in the interior and in the garden. On google-maps you can see that the garden is now defined in different areas. Inside and outside are becoming one. That's what we're striving for in our designs. Today we visited the Barn house in Werkhoven with our apprentice. The house is positioned inside the garden, instead of in the front. Instead of looking towards the garden, you live inside the garden. For the design we were inspired by Richard Neutra, John Lautner and Kazuo Shinohara. Yes at last! 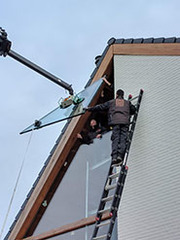 The window-glass for the house in Werkhoven has arrived from China. Today it is placed into the construction. Presentation of our first sketches of the renovation of the farm in Meerkerk. We mapped the position of the trees carefully. The positions are showed in a model. We folded the extension carefully around the trees. A new commission. The renovation and extension of a farm in Meerkerk. The location with its beautiful large trees is unique. A new commssion! 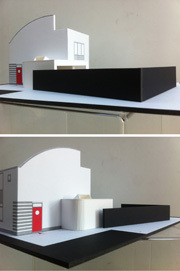 Our first ideas for an extension of a house with a view over the ponds and canals of the Nieuwkoopse Plassen. A typical Dutch landcape nature area. Today our design has being aproved by the clients. 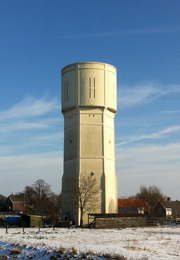 We are doing a research for the transformation of the watertower in Dirksland, commissioned by BOEI Foundation. We found the original drawings from 1939, at last! Today we celebrate that the construction in Werkhoven reached its highest point. Our company-sign is hanging on a construction-site again. 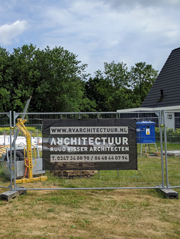 Construction work for the house in Werkhoven has started. A new commission! We opened the back-facade of a relatively closed dwelling. The cramped living areas inside the house are opened and connected. Simultaneously we opened the living areas inside the house to the beautiful garden. It's a totally new living experience and the clients are enthusiastic. 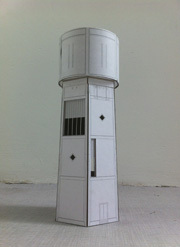 We finished the model for the Watertower Overvecht as a starting point for our design research. Finally we can start now! A bathroom-pavilion. Our first ideas for a freestanding bathroom next to a former bridgewatchershouse in Arkel. In collaboration with my two great colleagues Fumi Hoshino and Mo Bayo! We have, meanwhile, won the pitch for the transformation of the watertower. And we have an idea of which direction our design has to go. The location of the watertower however, has still to be kept secret. We are pitching again for the reuse of a watertower. This is going to be our best plan! Our graphic designer Frederik de Wal, has a new website. And we are proud that our office-style has been chosen as one of his refence projects. 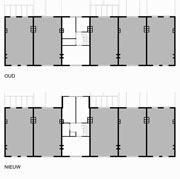 We’ve set the outlines of the house we designed for a plot in Werkhoven with construction tape. In this way we can see directly on the spot if we made use of the sightlines of the location. 'Resguardada en lo sagrado'. Interview in the Mexican newspaper Reforma for the monthly Architectural Supplement. And we have been published on the front page! This photo of the interior of our project in Meerkerk, is being featured on the website of our photographer René de Wit. Next to prestigious architectonic projects like the railway station in Breda or the Rehabilitation Centre Groot Clingendaal. The extension we made in the Steve Bikostraat in Utrecht is going to be overgrown now. Just a bit more and we will only see the round corner. Stretch the Roof! One of our latest new projects. A renovation of a house built in the 70's. The house is a bit small and poky now, but we will change that by completely opening up the living area. 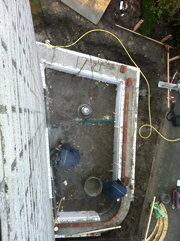 On the back façade we will create a vide of 3 meters deep and we will extent the roof also 3 meters to the garden side. Creating a space which is as well inside as outside. 'From reformed church to a revolutionairy house'. We are in the newspaper! 'Hart van Holland'. The first photos by René de Wit, of the House in the Tolstraat Meerkerk have arrived. 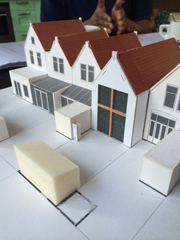 A family of four in Rotterdam asked our office to design a new house on a lot in Goudswaard. Instead of designing a traditional house with windows through which one can see the garden, we designded a house where garden and living are intertwined. If you want to know more about thie project, today the photos of René de Wit have arrived. 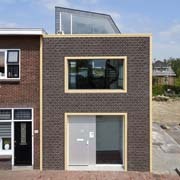 Look at the projects: House in Goudswaard. The article:'small projects, renovating the house instead of moving', by Pieter Graaff, is nominated by the Dutch Architecture Magazine: De Architect, as one of the five best essays of the year 2016! In the esaay is a prominant place for our project: Stretched House. Our project: 'Das gestreckte Haus' has been published in a German book about 'Reihen- und Doppelhäuser': "Der Niederländische Architekt Ruud Visser und sein Team (Fumi Hoshino) sind bekannt für aussergewöhnliche Lösungen und hohes Engagement, auch bei kleinere Projekten". At last we found the original drawings of the pumping station in Ameide. Now we can start our study of the possiblity for reuse of the buidling. Frederik de Wal designed a flyer for our 10 year anniversary. The flyer will be given out on the Eigen Huis Verbouwen Beurs which we will join on the 7th, 8th and 9th of October. First foundation pile for the house in the Tolstraat Meerkerk. Building has finally started. 'The stew-architecture of Ruud Visser Architects tastes like more'. Beautiful article written by Jan-Willem Kömmer in the Dutch magazine Mebest (June/July 2016) about our office. 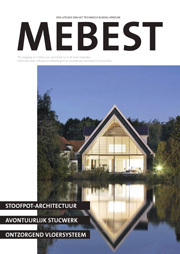 Our project 'House in a church' is covering the front page of the Dutch magazine: Mebest. 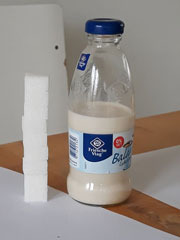 The dialogue between existing material and addition can be formed in different ways. One way is to observe from a distance, but another way is to participate. The different ways of interaction can be ordered into a matrix (published in De Architect May 2016). Our project 'Stretched House' has been published into the matrix as: 'Participant - The existing situation as heritage'. And is being termed as: 'adaptation'. 'Not adding something, but take the existing situation and adapt it to the needs of current times'. 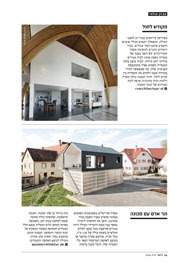 Our project: Stretched House, has been published in De Architect magazine of May 2016. The article is titled: 'Small projects'. Which refers to the exploding home-extension market. Our project is highlighted. For the first time, two of our projects have been published at the same time in one architecture magazine: Habitare Magazine (Brasil) January/ February 2016. For more information about the publication look at the projects: House in a Church and Stretched House. Our project on the front page of Dezeen! Along projects of famous architectural offices like OMA, West8, NL Architects and West8, our project: Stretched House is published in the announcement for the new pinboard of Dezeen. Featuring 'innovative Dutch Architecture'. No less then two projects of our office are featured. 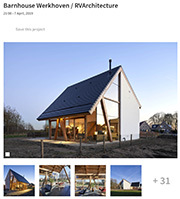 Our project Stretched House is on the pinboard too! In some projects all data seem to fall into the right places without any effort: program, location, view, daylight, garden and the budget which is set by our client. They are the most beautiful projects. Not 'designed' but 'originated'. 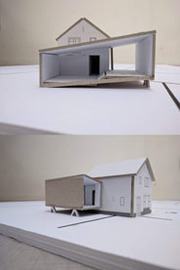 Such was this project: a family house in Goudswaard (a small village near Rotterdam). Eventually our client couldn't agree with the bank about the finance of the house. Too bad! Beautiful publication in the South-Korean magazine Maru of October 2015. Eight pages with photos of the new and old situation. 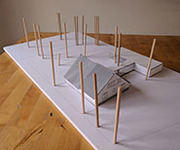 For more information about the project see under 'publications': Stretched house. Our project Stretched House is being published on Archdaily! A new project in Meerkerk. A long small residence in the middle of the centre, enclosed by neighbouring houses. In the front a busy street, but on the back a wonderful view of the river 'De Zederik'. 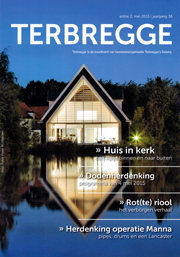 Our project is on the cover of the 'Terbregge', the paper of the local-union: 'Terbregge's Belang' of May 2015. With a nice article: 'House in a church with wonderful view'. 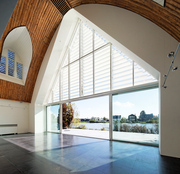 Next to our photos is mentioned: Ruud Visser Architecten. This is a mistake. The photos are not made by us, but by René de Wit. Yes! Our clients are enthousiastic about our design for their house on the Bergse Linker Rottekade in Rotterdam. Now we are heading for the aesthetic commission of the municipality. Work in progress on the watertower Nieuw Lekkerland. The client has made the huge openings in the facades. Giving it a spectecular view over the surrouding area. The last phase of the building process for our project in Rijwijk. The constructor placing the wooden frame. The result is excellent. Thanks to our clients and a good constructor: Schouten Bouw. The execution of our project on Delftweg in Rijswijk is in full progress. It's our first neo-traditional extension. According to research of the Research Institute of Habitation and the School of Real Estate the commissions will roll right in after completion. It is the most popular style at the moment. Hello world! Starting from today our website also has an English version. Click on the letter 'E' for english. The banner is designed by Frederik de Wal. A photo of the school class of schoolteacher Mr. Haafkens, taken on the former schoolyard. On the same spot we placed the poem of Dirk Vruggink. I found this old photo in the book: ‘Lexmond en de Lexmonders’. For more information about our project, we refer to: ‘Poem on schoolteachers house’. 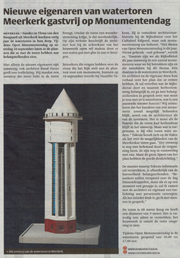 ‘Moderate interest for the water tower in Meerkerk which is for sale’, states todays newspaper (AD Rivierenland). Two weeks ago our office has been interviewed concerning our design for the conversion of the water tower. A beautiful article has been published. 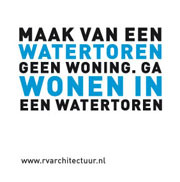 For more information we refer to: projects/ watertower Meerkerk/ publications/ AD Rivierenland. 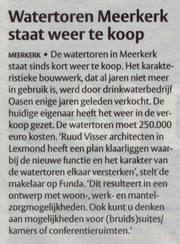 ‘The water tower in Meerkerk is for sale again! Ruud Visser Architects from Lexmond has already developed a ready-to-use plan, in which the character of the existing water tower is enhanced by the new function’. Says the newspaper (Het AD Rivierenland) of September the 18th. Yet another program will lead inevitably to another design. 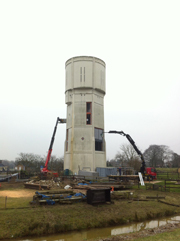 Who gives us the chance to work on the water tower again? All hurdles are taken now. It seems that our design for the extension of the Delftweg is going to be realized. It was a long way: starting with a letter to the Mayor and Councillors, changing the development plans, Building Permission, estimate of costs and taxation. Now we are making up to invite the constructors. On the 29the of June, the Dutch football team played against Mexico. 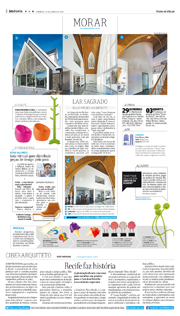 On that day our project ‘House in a church’, got published In the Brazilian newspaper Folha de Sao Paulo. Our proposal for a company sign, painted on the façade, has been approved today by the Commission of Historic Preservation and the Planning Authority. Thanks to Frederik de Wal for the design. What a nice surprise during the opening party of the extension in Utrecht. 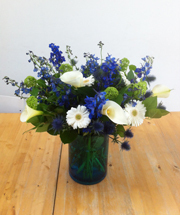 We got these beautiful big bouquet of flowers from our client. And we got lots of compliments from the visitors, including this one: ‘from a typical through-room house to a design house’. I hope we will get more of these special clients in the future, because the end result depends on the cooperation between the architect and the client. 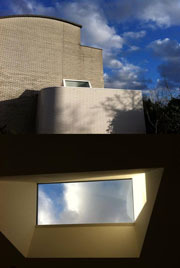 Photos of René de Wit of the extension of the corner house on the Steve Bikostraat in Utrecht. However, due to a car parked exactly next to the extension, we couldn’t take all the photos we wanted. Soon we have to give it a try again. 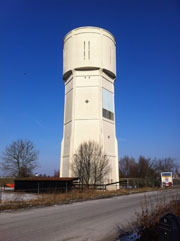 We’ve got the Building Permission for the conversion of the water tower in Nieuw Lekkerland. Building can start! Crafting a design is one thing, actually constructing it is something else. Cutting, welding, rolling and correcting the faults afterwards. 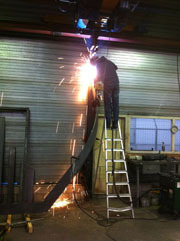 It's a heavy job, constructing the staircasebeams for our project in Schoonrewoerd. Rem Koolhaas had giraffes, we have chickens. 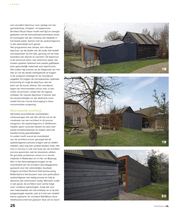 Photos of René de Wit of our tiny shed with sun collecting panels in Hei- en Boeicop. 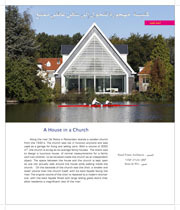 Our project ‘House in a church’ has been published in the Saudi architecture magazine: Umran Magazine. For more information about the article we refer to: House in a church, publications: Umran. The renovation of the farm in Schoonrewoerd has started. During the demolishing process we will encounter things that we expected differently. That’s why we have to adjust the design continuously during the building process. A relatively small extension, but a big spatial effect. The skylight is situated on the west side and will catch the moment of sunset. A special requests of the client. Still some tiny things and the building process is finished. 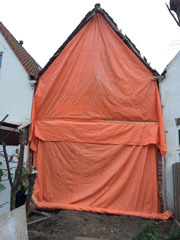 The construction work for the extension of the corner house on the Steve Bikostraat in Utrecht has started. The building lines are becoming visible. In any case, the scale is perfect. Two times green light already and very enthusiastic reactions on our design for the conversion of the water tower in Nieuw lekkerland . Now on the 26th of September, we got the third and final green light. According to the Commission of Historic Preservation and the Planning Authority we not only succeeded in preserving a historical monument but we also succeeded in making a monument for our present time. A concrete floor, 4 wooden frames and gulf plates. It couldn’t be more simple. The form of the shed is defined by the exposure of sunlight, the access, privacy and the barn next to it. It’s different from every angle. The gulf plates are draped over the frames like a table cloth. Whether we work on a big or small project, a high or a low budget, materialisation and detailing always gets our full attention. Each of our projects is ‘tailor-made’. That’s also the case with the gulf plates for the shed in Hei- en Boeicop. Our smallest project ever: a tiny shed for a wagon and sheep food. On top of it 12 sun collecting panels. The shed is situated next to a monumental barn of a monumental farm. The sun collecting panels are enough to provide the entire farm from energy. City planning commission, clients, neighbours and now also the Planning Authority concerned with the aesthetics agree with our plans for the extension of the entire house on the Delftweg in Rijswijk. Now we are going for Building Permission! Today the book: Resurrection of Buildings – 50 Case Studies has been published. Initiated by: The Architecture Branch Huazhong University of Science and Technology Press in Beijing. 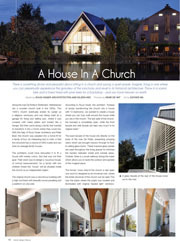 Our project ‘House in a church’ is one of the published projects. 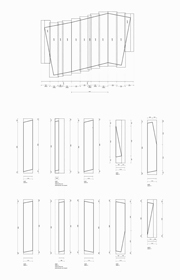 A new commission for the extension of a house in a characteristic row of houses on the Delftweg in Rijswijk. For a family with two children. The client asked us to design an extension on the ground floor. 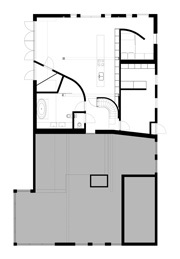 However we concluded that it is the first floor that actually needed more extra space, more than the ground floor. The bedrooms are too small. That’s why we proposed to extend the house by 2 meters and move the entire back façade into the garden. This would be just enough to adjust the house to today’s requirements. Although conflicting the development plans, our idea is approved with great enthusiasm by the city planner of the municipality. Now we are going for a great design! 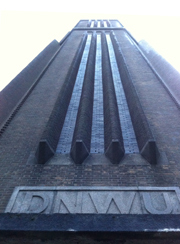 On my way to the information meeting for the conversion of the water tower Nieuw lekkerland. This evening 20:00h. Preparing the last Photoshop pictures for the PowerPoint. 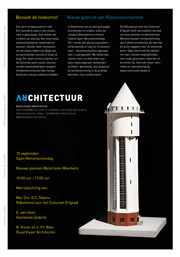 The invitation for the information meeting on the water tower Nieuw Lekkerland is finished. Our plans for the conversion of the tower will be revealed on the 14th of March at 20:00h. 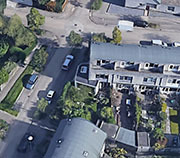 The address is: Lekdijk 82A. The invitation card is designed by Frederik de Wal. Whether the project is big or small, we always see a chance in every project to strive for architecture. 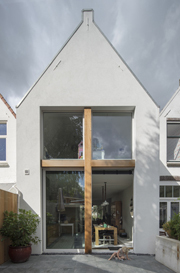 An extension for a corner house in the Steve Bikostraat in Utrecht. A complicated situation in a small-scale-garden-neighbourhood originally designed by the architect Van Tilburg. Applying for Building Permission is finished. We are going to build! Today we won a pitch for the renovation of a farm situated in Schoonrewoerd. We got the commission for the whole process of design and realisation. The project contains the renovation of the existing kitchen, dinner room and bathroom. A test-letter for the poem on the back façade of the schoolteachers house on De Laak in Lexmond. The design for the calligraphic writing, many times magnified, is made by Frederik de Wal. 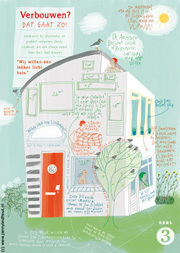 For more information about the project we refer to: Poem on schoolteachers house. Green light for the water tower Nieuw Lekkerland. 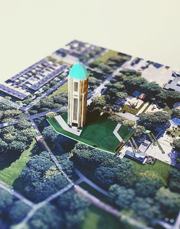 The Commission of Historic Preservation and the Planning Authority are very enthusiastic about our analyses and concept for the conversion of the water tower. Now we have to work out the materialisation and details. The window cleaner at about 10 meters height, in our converted church in Hillegersberg. Impossible is nothing. (Thanks to the owner of the residence for the photo). Finally! 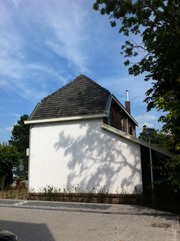 The poem of Dirk Vruggink on the back facade of the former schoolteachers house will be executed at last. Graphic designer Frederik de Wal designed the typography of the poem. The text will be put on the wall in calligraphic writing, but magnified many times. The background colour is grey, the text is white. For more information about the project we refer to: Poem on schoolteachers house. 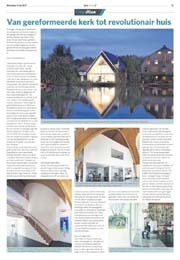 Our project ‘House in a church’ has been published in the Malaysian interior design magazine idS of Aug/Sep 2012. 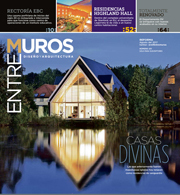 For more information about the article we refer to: House in a church, publications: idS. 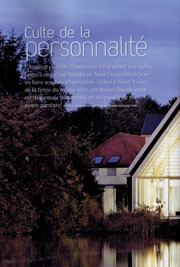 Our project ‘House in a church’ has been published in the French magazine Avivre of June 2012. 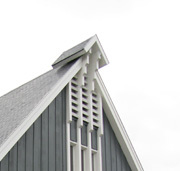 For more information about the article we refer to: House in a church, publications: Avivre. Stunning views around the water tower play an important role in the design process. The connection between the interior floor plans and the surrounding views is crucial. For the best views, we make openings on every side of the tower. Giving the water tower a panoramic anchoring into its surroundings. Our project ‘House in a church’ has been published in the Canadian magazine Votre Maison: ’12 residences de prestige pour vous inspirer’. 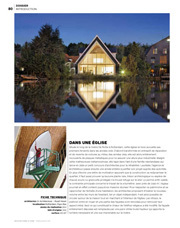 For more information about the article we refer to: House in a church, publications: Votre Maison. Last weekend we had a very successful first experience as an exhibitor on the ‘Eigen Huis’ fair. We were overwhelmed by all the positive feedback we got on our projects. Interesting conversations about challenging new projects like the renovation of a monumental farm or the conversion of an old factory into a family home. Of course we hope that some of these challenging projects will become reality. There is a big chance we will be standing on the fair next year again. From March 30th until the 1st of April we will be standing on the ‘Eigen Huis Verbouwen en Inrichten’ fair in Utrecht. The stand is designed in collaboration with Frederik de Wal. If you are planning to go there, give us a reply and we can give you free tickets. 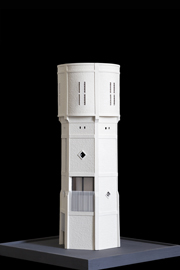 We are fully occupied now by the design for the water tower in Nieuw Lekkerland. The owners have the marvellous idea to change it into two apartments with a swimming-pool on top. The view from the water tower is breath taking. On one side of the tower one looks over the river De Lek, on the other side one has a view over the typical Dutch polder landscape with its many windmills. The 8 apartments in Hei- en Boeicop has reached completion. We worked hard on this project and are very content with the results. Thanks to a building constructor: P. van Leeuwen from Meerkerk, who could even take the plan a level higher during the construction-phase. Photos of the finished project can be found on the website: 8 apartments Hei- en Boeicop. 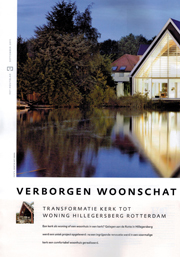 Our project ‘House in a church’ has been published in the magazine Bouwkavels nr. 1/2012. Beautiful article by journalist Cécile Dorseiffen. 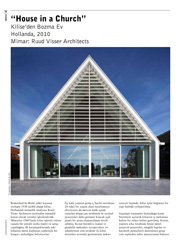 For more information about the article we refer to: House in a church, publications: Bouwkavels 1/2012. On Wednesday the 7th of December, the highest point has been reached of our project: 8 houses in Hei- en Boeicop. We celebrated this event with the builders of the construction company (P. van Leeuwen) on the spot. Six apartments have been sold already and two will be rented. The expected completion is in march 2012. 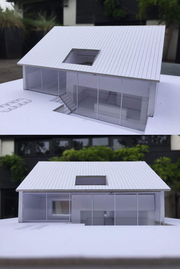 The planning authority is enthusiastic about our design for an extension of a house in Schoonrewoerd. On the South and West façade, the house adjoins a gorgeous old orchard of 100 meters long and 20 meters wide. The house will be adjusted to fit new building regulations and will be energy neutral. Wheelchair-friendly. The roof will be lifted and the living area will be extended by building an addition. Our design is inspired by the black rustic barns found everywhere in the meadows around the house. 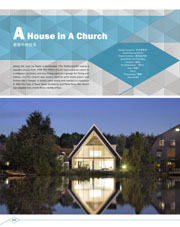 Our project ‘House in a church’ has been published in the English/Chinese architecture book: ‘new vision on house’. For more information about the article we refer to: House in a church, publications. The ‘Foundation stone laying ceremony’ for the 8 apartments in Hei- en Boeicop. This project consists of 4 apartments on the second floor for young couples and 4 apartments on the first floor for elderly. Rules and restrictions for these apartmentswere enormous. It consists of two A4 surveys of more than 200 pages each from the municipality. Added with restrictions for sustainability, elderly housing and budget. Completion of the apartments is expected end of January. 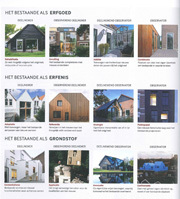 The bathroom in our project ‘House in a church’ made by 13Speciaal, has been published in Bouwkavels nr. 04/2011. For more information about the article we refer to: House in a church, publications. In the next issue of Bouwkavels (nr. 01/2012), the whole church project will be published. Today, 19th of October, we had an appointment with the planning authority of the city Rijswijk. 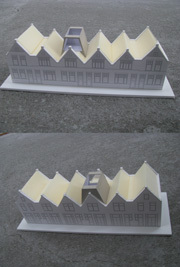 We designed a rooftop structure on top of a row houses built in 1900. Together the row houses form a gorgeous composition. Our rooftop construction will be the first. That’s why the planning authority asks for high requirements. Fortunately they were very enthusiastic about our design. 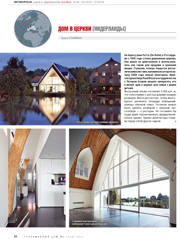 Today, the 4th of October, our project ‘House in a church’ has been published in the Russian architecture magazine: Sovremenny Dom (Modern House). For more information about the article we refer to: publications of House in a church. Last Friday, 30th September, our project ‘House in a church’ has been published in the Norwegian Newspaper VG. In the special edition with the title: Heilig Hus. You can find more information about the article at publications of House in a church. 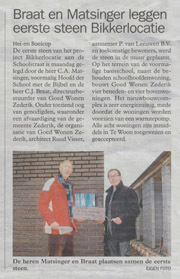 Announcement in the local newspaper Het Kontakt. On 10 September, Heritage Day, the water tower in Meerkerk will be open for public. Our conversion plans for the tower, will be presented. 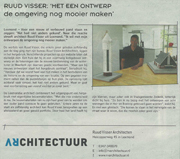 For the article we refer to: Watertower Meerkerk, publications. Announcement of Heritage Day, 10 September. Beautiful card made by Frederik de Wal. The buildingprocess of the 8 appartments in Hei- en Boeicop has started. Last Thursday, the 18th of August, the building constructor, Van Leeuwen, has started drilling the stakes into the ground. Our new website is online. Thanks to: Frederik de Wal, De Webmakers and René de Wit. Today we got an email from the owner that the renovated church in Hillegersberg will be given the Roterodamum Monument honorary- prize. 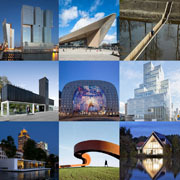 The prize is awarded yearly to private owners who made great efforts to keep Rotterdam’s heritage alive. The prize consists of a certificate and a bronze medal to hang on the façade of the church. The prize will be awarded on 10 September 2011, heritage Day, by Hamit Karakus, City Councillor of Housing, Development and Economy. Almost 20 years ago, in 1995 we (Ruud Visser, Klaas Waarheid and Kees Plomp ) won a BNA competition for the revitalisation of the Cheesemarket in Leiden. This competition became a topic again when RAP (Rijnlandse Architectuur Platvorm) organized an exhibition about the Cheesemarket. In the 20 years that past since the launch of the competition, lots of urban ‘white spots’ in Leiden has been successfully developed. But the Cheesmarket is still the chaotic parking space as it was in 1995. This was the reason that we started to form an alliance with Indestad developers who deliberated with the municipality of Leiden about the possibilities to realise our project. After all we won the competition. Unfortunately we heard today that the municipality is making too demanding and therefore Indestad is withdrawing from the deliberation. Today we started to list the many bridges of the small town Hei- en Boeicop. We want to examine the similarities and how they are related to history, social context and/or location. The research will be done in collaboration with Rolia Wiggelinkhuyse, a historian from Hei- en Boeicop. 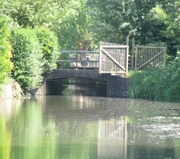 Rolia will examine the historical and social context of the bridges. At the end of March the renovated church in Hillegersberg received a nomination shield from de ‘Vereniging Stedenbouwkundig Wijkbehoud Hillegersberg, Schiebroek en Terbregge’ (local society for the preservation of heritage). The shield has been awarded for the 60th time, but this year for the first time it is awarded for a ‘renewed’ object. According to the shield-commission the intervention is done with great respect for the original building. But in a sharp and contemporary way. More information about the awarding of the shield can be found on the website. 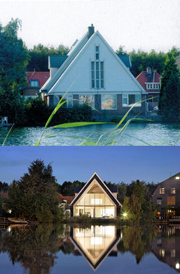 See: ‘A house in a church’, publications: ‘Tussen Wilgenplas en Rotte’, May 2011. On the 29th of April, we received an email from Mr. Riemer Dekker. With the announcement the church we renovated in Hillegersberg can be seen in newly found images of the food droppings over Rotterdam in 1945. See: http://www.youtube.com/watch?v=c6r66DCvp9I. You can see the church at about 1m27.